A Coleg Cambria event starring Welsh rugby greats raised an incredible £42,000 for the NSPCC. 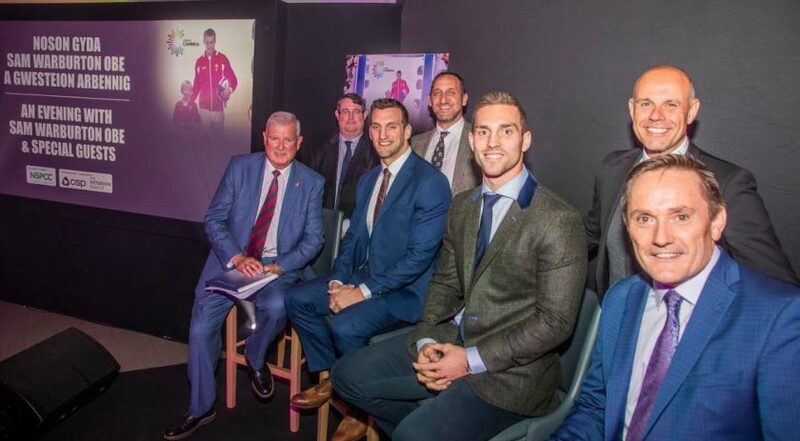 An Evening with Sam Warburton was attended by more than 200 people and saw the former Wales and British Lions captain headline the celebration alongside past teammates George North and Ryan Jones. BBC broadcaster Jason Mohammad hosted proceedings and was joined by ex-Wales scrum half Rupert Moon, who helped drive the figure upward in his role as auctioneer. The children’s charity is Sam’s main beneficiary in his testimonial year; he thanked the college, NSPCC Cymru board member Hywel Peterson and Alan Peterson – chair of the NSPCC’s Wales Appeal Board – for helping to raise such a phenomenal amount on the night. Cambria is targeting £100,000 for the NSPCC in 2018 and is on target to do so thanks to a series of activities and challenges held throughout the year. These included a gruelling 48-mile trek in 14 hours across three counties during the summer by chief executive David Jones and wife Julia. “We are absolutely thrilled to have been able to help Sam Warburton and Alan and Hywel Peterson to reach this huge total for the charity,” said Mr Jones. “A lot of hard work went into the event and I would like to thank everyone involved, particularly the hundreds who attended, for being so generous and raising so much money for a vital charity which does so much good in Wales and the UK. The evening also featured a performance from Only Men Aloud and a three-course menu showcasing the very best of Welsh produce in association with chef Gareth Stevenson, a Cambria alumnus. Among the many businesses to supply auction prizes and support the event were Wynne Construction – which built the impressive £15m Deeside facility – Moneypenny, Green Valley Solutions, housebuilders Redrow and Jones Bros, Ruthin. Alan Peterson said the evening was an “unequivocal success” and thanked everyone who attended. “The amount of money raised for the NSPCC at Coleg Cambria, who are huge supporters for the charity, is testament to that,” added Mr Peterson. “A huge thank you to Sam and his continued support for the NSPCC as his main charity beneficiary in his testimonial year as well as everyone else who came to make the evening truly special.